New Star Fox Game Will Support Co-Op. You Pilot. I Shoot. An optional co-op mode in the upcoming Wii U Star Fox game is going to let two players command one Arwing with one flying the ship and the other shooting from it. 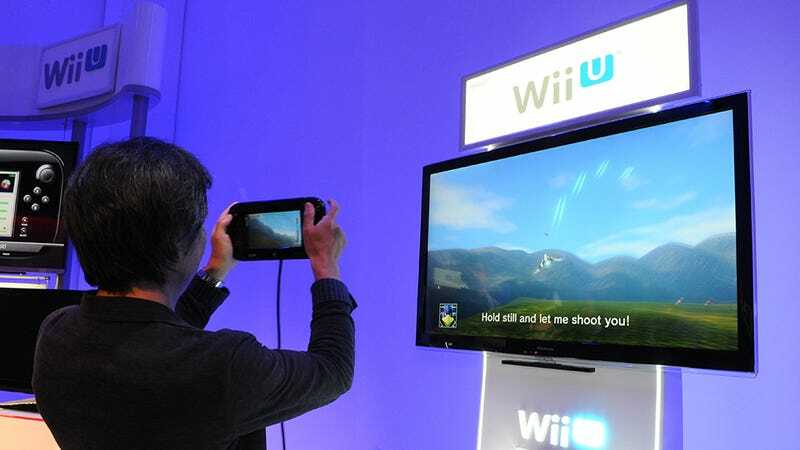 Nintendo's lead game designer Shigeru Miyamoto described the mode to me this week in L.A., as he elaborated on the value of designing the new sci-fi flight-combat game around the concept of using the Wii U's GamePad screen and the TV screen to provide different views of the action. I'd been skeptical about the general concept, despite having tried the game. And I told him as much, noting that I found myself almost exclusively looking at the game's cockpit view in the GamePad screen and rarely looking at the TV to watch that display's behind-the-fighter view. Perhaps, I'd speculated, the problem was that the arenas in the first demo of the game were safe to fly in; there was no good reason for me to be careful about where my ship was going on the TV. When Miyamoto was first showing the game to me and other reporters on Sunday, he'd said that it would take time for it to feel natural to look back and forth between the two screens. He had also said he hoped that people would enjoy being able to use the GamePad's motion sensor to look around and shoot in any direction from the cockpit while flying independently, using the GamePad's control sticks, as displayed on the TV screen. On Thursday I asked him to expand on why he felt that was a strong idea. "To me, what's most important is probably the gyro sensor in the GamePad," he said. "It's a little bit hard to understand, but when you're looking in that third-person view, you can see what's happening straight ahead of you, but when you have the cockpit view, you actually have to look over and see what's to either side. "The third-person view of the entire area, what it does, it gives you a broader view of what is happening around you, certainly more than you can see when you're in that cockpit view. And so as we get deeper into the missions of the game, we'll be able to use that to give people reasons to take advantage of that. So, for example, if they're in a course or a level they may need to figure out where the exit is, so they'll have to be flying around, looking up and around to find that." To illustrate his point, he described a moment in the Sunday demo in which the player, as Fox McCloud, can shoot down his enemy Star Wolf. It's easier to find where Wolf crashed by looking at the TV, Miyamoto noted. He incentivized players to do so by dropping a collectible medal where Wolf crashed. Miyamoto's demo had also included a "helicopter" level that put the player in control of a hovering fighting craft that could drop a tethered robot onto the roofs of buildings. When the robot was dropped from the ship, the player's GamePad would show what the robot could see, while the TV would stay focused on the helicopter. This had felt, to me, like the most successful use of Star Fox's two-screen design. "We'll be able to design it in ways that you're still flying the ship on the TV screen," he said, "but simultaneously piloting the robot inside buildings and things like that down below." Miyamoto said the two-screen approach could also enable a co-op mode, one that presumably maps the game's flight (and tank and helicopter!) controls to a controller other than the GamePad and dedicating the GamePad to the player serving as a gunner. "We're still developing the game... but one thing we always like to try to do is have some sort of way for people to play together, and the thing about these types of space shooter games is that they're fairly easy to get into but they can look somewhat intimidating and complicated, so this time what we're doing is we actually have a mode—we just didn't show it—we've designed it so there's the ability for cooperative play where one player is able to pilot the ship and the other player is able to use the GamePad and be the gunner. So they can just aim and shoot. They don't have to worry about flying." One other way the two-screen idea might be cool? Better cut-scenes. Dare I say, more immersive cut-scenes. He explained: "If there's an event scene or cinema scene—because you've got your cockpit view that's reserved for you—the event could be playing out on the TV and you've got a different view of that. So we'll be able to take advantage of [you] being able to feel more like you're part of the event that's happening because of your ability to look around with that second screen." Miyamoto knows what he's doing, and it's not surprising that his explanations made the game sound more appealing. We'll hopefully see more of the game in the months ahead. The game is slated for release on Wii U some time next year.